In the period following the end of the second world war, demand for British Columbia lumber products fell sharply, as previously a large amount of the material was sold to the United Kingdom in support of the war effort. Three organizations: The British Columbia Lumber Manufacturer’s Association, the Plywood Manufacturers Association of British Columbia and the Consolidated Red Cedar Shingle Association of British Columbia banded together to create a new organization called Western Woods. Western Woods was tasked with creating a market and demand for their products in Canada, and inspired by the public relations success of the Case Study Program (sponsored by Arts & Architecture magazine) in the US, decided to create their own version of the program here in Canada. 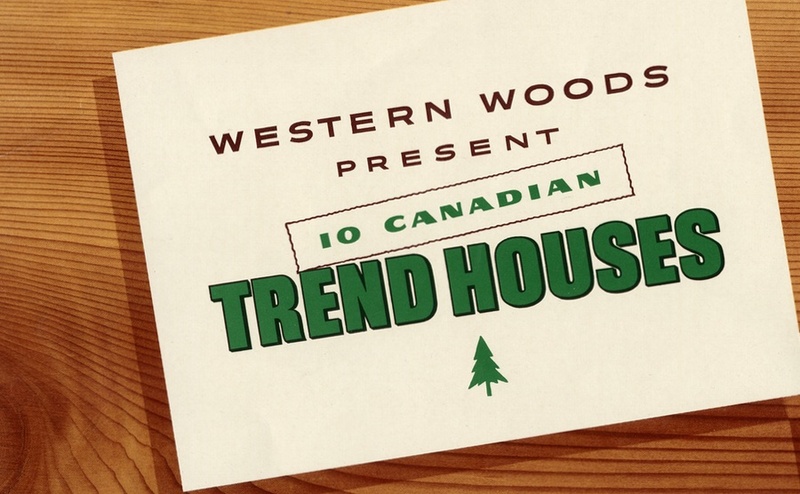 Called the “Trend House” Program, Western Woods created eleven houses across Canada to feature the use of softwood lumber in the construction of new homes. Local architects were selected to design and build the showcase homes in Victoria, Vancouver, Edmonton, Calgary, Regina, Winnipeg, London, Toronto, Montreal and Halifax. The design parameters for each of the houses was left up to the architects, who were selected from local firms, and were proponents of modernist design. These architects were told to create houses that were ahead of the current building technology, giving people a view of what residential homes might look like 5 or 6 years in the future. The interior of the Trend Houses were outfitted by Eatons, using primarily furniture and textiles from Canadian designers selected from a group of experts at the National Gallery in Ottawa, which was later to become the Canadian Design Council. General Electric Canada outfitted the Trend Houses with the latest up and coming mechanical, lighting and electrical systems, including the “WeatherEye” control system for the furnace, fluorescent lighting throughout the house, and a remote control wiring system. Upon completion, each of the Trend Houses were opened to the public for a four month period from April through August of 1954. Trained hostesses would take you through the houses and point out all of the innovations in terms of materials, design, construction and furniture etc. The Calgary Herald estimates that over 30,000 Calgarians came through the house in the time it was open (which is especially impressive considering the entire population was around 160,000) and was so popular that the police had to be called out on occasion to make sure guests left the house by 9 pm. 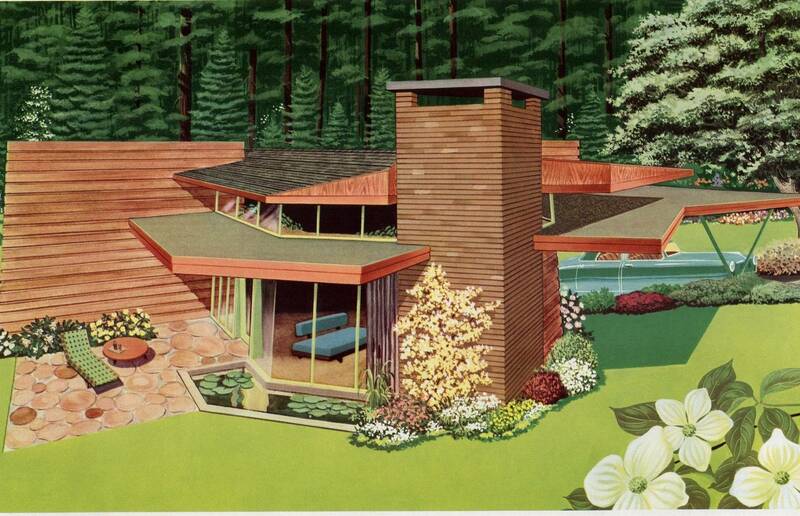 The houses were not intended to be ‘show homes’ in the sense that we think about them today, but were more akin to the “House of Tomorrow” type of demonstration homes that gave people some ideas about what their next house could be like. Similar things were happening in the auto industry for example, where it was the beginning of the Golden Age of the ‘concept car’ which sparked many people’s ideas about what the future may hold. 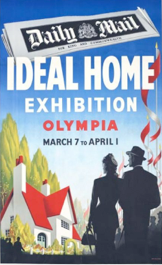 The Trend Houses were truly a celebration of Canadian industry, design and materials, and exposed Canadians to new ideas in architecture, construction and interior design, influencing the design of homes in Canada for years to come. Sadly, in recent years a few of the Trend Houses have been torn down, which points to a lack of understanding of the significance of the program in terms of it’s affect on Canadian architecture as well as the lack of information on the program in the first place. Currently there are two Trend Houses (Victoria and Calgary) which have received formal historic designation, and as such cannot be demolished, which will help to preserve the legacy of this program. In 1953 Peter Rule from the firm of Rule, Wynn and Rule was selected to design the Calgary Trend House. The firm was a little unusual both in the fact that it was based in Alberta when most of the leading firms were based in the East, and that all the principles had all received their degrees in Architecture in Alberta. In the 1950s with the unprecedented wealth that flowed into Alberta from it’s oil industry the firm kept busy designing a number of important buildings including corporate, municipal and residential commissions. Based in Edmonton, the Calgary office was closed in the 1980s, but a renamed version of the same firm is still practicing more than 75 years later. A more detailed description of the firm can be found here. The site selected for the house was in the neighbourhood of Elboya, southwest of the city centre, overlooking the Elbow River and with a view of downtown. The project was announced August 1953 and was completed in April 1954, two weeks behind schedule. The 1600 square foot house was designed in two sections in the form of a “T” to separate the public and private spaces, and made use of large amounts of glass and West Cost Cedar. This was also one of the very first examples of a split level home in Calgary, taking advantage of the gently sloping topography of the lot. The exterior of the house was clad in clear coat cedar. The pitched roof at the back of the house was shingled in cedar as well. The construction was carried out by local contractor C.L. Brown began in the fall of 1953 and the house was completed in time for it’s opening to the public on April 19, 1954. After four months of public viewing the first owners of the house moved in. Fast forward to fall 2001 in San Francisco where the current owners first saw the property online. Having been on the market for over a year, the owners arranged to see the house next time they were in Calgary, put in an offer and moved back to Calgary in May 2002. Aside from a heavy coating of paint and a few partition walls being erected, the house was largely intact and original.